Three taste testers bit into the first hamburger made from lab-grown beef Monday morning in London. They labeled it similar in texture and lacking in flavor compared to the real thing, but the bigger surprise came when the team behind the burger revealed their financial backer: Google co-founder Sergey Brin. Brin’s $325,000 went toward a team of researchers called Cultured Beef, which grew stem cells from cow shoulder muscle into strips of muscle fiber. Around 20,000 strips were mixed with bread crumbs and a binder, plus red beet juice and saffron for coloring, to form the burger tasted Monday — an event Brin said many people would consider science fiction. At the tasting event, which was streamed live online, Maastricht University professor Mark Post revealed his team’s burger patty in a petri dish. Cornwall, U.K., chef Richard McGeown then fried it in a pan with a substantial amount of butter. He said it cooked in about the same time as a regular beef burger. Nutritional researcher Hanni Rützler was the first to bite into the burger. The burger had no fat in it, as Cultured Beef has yet to develop a way to grow meat that replicates beef’s natural fat content. Even frying the patty in a substantial amount of butter wasn’t enough to hide that the burger needed fat. The tasters also wished the burger, which was served plain without condiments or other toppings, had salt, pepper and other spices in it. Post said he was overall happy with the tasting, which was meant to prove that they could grow meat in a lab. 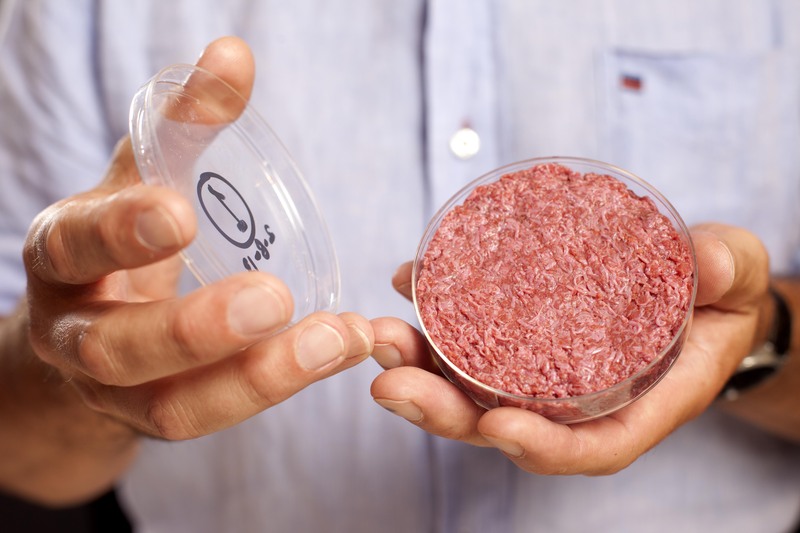 Cultured Beef has pushed hard on the environmental angle for eating lab grown meat. Brin also said he funded the project for its potential to create a sustainable source of meat.